Well, I suppose it had to happen sooner or later. We all get older if we are lucky, so a couple of months ago, I went to the local Lawn Supply and bought a battery powered chain saw. I had begun to find myself putting things off because I didn’t want to have to try to start the gas powered saw and I was starting to get really irritated with the whole thing. When I went to buy the battery operated saw, they asked me for my “Man” card. I had to turn in the card before they would let me buy the saw. Nonetheless I persevered and went ahead with the purchase and I am here to tell you my new saw works like a champ. I make a lot of bowls from found wood and a chain saw comes in very handy for that sort of work. I use the saw to score the end grain of a round log and then take my iron wedges and the “sludge” hammer and bust the round into two halves. It is quick and easy and gives a good flat split. After that I mark out a bowl shape on one of the halves with a circle template and a carpenter’s pencil. I use the saw to trim the corners and then nudge it towards roundness by smoothing off the edges until it will fit on the lathe, and I am off to the races. People ask how long a battery powered saw will last and if it will do the job. The answer is if you cut pulpwood for a living, you don’t need or want one of these. If you make bowls and trim a few limbs around the house, then it works just fine. You can even use it inside the shop since there is no exhaust to suffocate you. As to how long it will run, with a full charge it will run longer than I usually feel like driving it. Isn’t that what it is about? The real joy is being able to pick it up and simply pull the trigger and go to work. The noise is less, it cuts everything I need to cut and it runs as long as I do. Then it will recharge completely in about 30 minutes. With the blade kept sharp, it cuts beautifully as long as you are not trying to cut a six foot redwood. Like any other chainsaw, you must provide oil for the blade. Wonder if I can shape enough bowls to get my “Man” card back? You will always have your man cad Terry! I couldn’t possibly agree more. The battery powered chainsaw is so nice for this kind of work that I don’t even own a gas powered. I bought a DeWalt Chain saw last year to use while healing from back surgery because there was no way I could try to start the ‘ol Stihl. I bought for a few quick trim jobs, but primarily to cut blanks for turning. Does a great job, pretty much experienced everything stated in article. I learned long ago that if someone is going to judge my manliness based on what kind of power tool I use, I don’t their input. Those saws are fantastic. I was pleasantly surprised by how much power it has for such a small light weight saw. Man card is never in question with Stihl. I have been using a 120 volt chain saw in my shop for a couple of years. Great for splitting logs for bowls in an air conditioned shop in the summer and much lighter than a battery powered one, not to mention cheaper. I still have a couple of Stihl gas powered for outside. I bought one from Harbor Freight, love it! 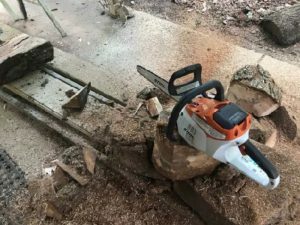 I would like to dispel this rumor, My Stihl MSA 200 battery chainsaw is the equal to a similar gas saw in power, I have cut a 16″ oak with ease, the Stihl electronic control compensates for the gradual battery drain, so the saw cuts with the same power from beginning to end, like a gas saw. Stihl also makes a carving bar and 1/4″ pitch chain which gives a extremely smooth cut. Had to laugh at my electrically challenged associate, who stands by his hard-to-start-next-time-around chain saw. His wouldn’t start, so we ran a fifty foot (12 gauge) cable to the cherry and apple wood pile and cut the entire stack with my Makita, which started every time either of us pulled the trigger. He had to be told, by more than just me, a one horse electric, usually, will trump a one horse gas for power at the chain. In the end, he had to admit the “pretend” (electric) saw did as good as his Stihl, and the tool-less features made it much easier to keep in adjustment. I should note, I do have a gas unit (a five dollar garage sale score) and it runs good. It only gets fired up when I’m out in an orchard making big pieces of fruit wood more manageable.